With fire in the sky, I went out to Galante Vineyards and saw huge flames rising from the last of the “Basin Complex Fire” and sipped a wonderfully crisp Sauvignon Blanc. Jack Galante had his Wine Gang day out to his beautiful and remote ranch in Carmel Valley to enjoy his estate wines and a BBQ with Chef Michael Reese, the Cajun specialist. It was hot and smoky, but a fun filled day and enjoyable tour. Jack has almost unlimited energy and skill, chatting away with his guests, pouring wine, four-wheeling to remote vineyard sites and poaching old wines from his private cellar with out coming up for air! His loyal following and team all celebrated with rose petal foot baths, spiced tri-tip, savory beans, pretty vistas and lots of Galante’s famed Cabernet Sauvignon, even a 1995 Galante Vineyards “Blackjack Pasture” to quaff on. I stayed with their bright and refreshing 2007 Sauvignon Blanc, as it was close to 90 degrees out and I was hiking around the vineyards. Over the hill the firefighters were back lighting and set a ridge a blaze with 60 foot flames, which looked terrifying, but was done to create a buffer zone and keep the fire line secure. Later in the day Jack took me up to his high elevation Pinot Noir vineyard, “Almond Flat”, and I was amazed at both the height and the danger in which I was put to get there! In the end it was a very rewarding trek as I got to see this amazing site and view the whole valley from there. Planted to mostly Calera clone with some other modern French clones, including 777, “Almond Flat” is a special place and a site that will produce some special fruit in the years to come. The current release, the 2005 and the 2006 both are big steps for this small winery and remind me of Nuits-St. George Burgundies with intense earthy and mineral notes and brisk, tight and dark fruits. These wines need air and food to show their class as intended. The 2005 gained elegance and depth with over 24 hours of air and I think the 2006 might be a 5-year lay down. In other words, like real Burgundy! 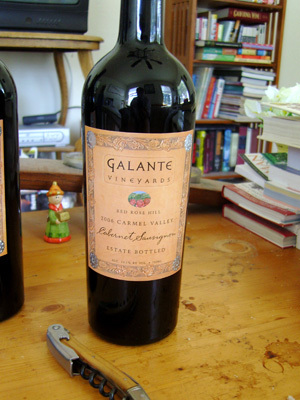 On a drink up note, their 2006 Galante Cabernet Sauvignon “Red Rose Hill” is a smash hit, with beautiful red fruits, smooth tannins and lush textures. This is a blend change, now included are small lots of Petit Verdot, Petite Sirah and Malbec that give many good complexities and fill this pretty wine out. Then there is the estate Sauvignon Blanc, this being from the 2007 vintage, with lovely tangy citrus and melon flavors that are zesty and pure. Both are their Wine Gang favorites, so be sure to call them quick like to get any that remain unclaimed! Another wonderful weekend gone, but long-lived memories forever! 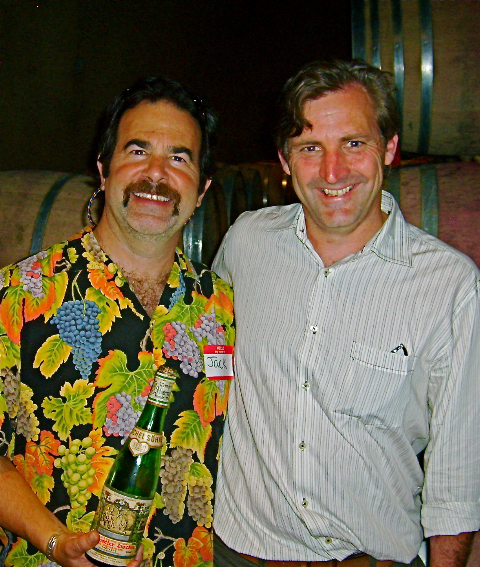 Last week I ran into Richard Alfaro and his wife Mary Kay, Alfaro Family Vineyards, and I re-tasted his 2006 Alfaro Family Vineyards Chardonnay “Lindsay-Page Vineyard” Santa Cruz Mountains Estate, and wow, I was again blown away! This is a world class Chardonnay that ranks right up there! I am not kidding you when I say it rates well against Batard-Montrachet and anything from this State for sure, in fact I had to bump it up a few points on score. I have been singing the praises of the South Santa Cruz Mountains for a few years now, mainly shouting about the Pinot Noir Like Richard’s estate, Windy Oaks and more lately Jennifer Pandol’s Pandol Pinot sourced from the Schultze Vineyard, but this Chardonnay is amazing and totally mind blowing. 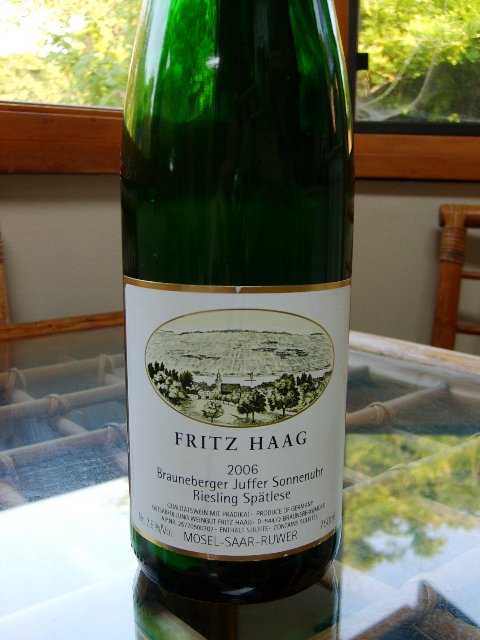 It is complex and lush from beginning to end with pear, apple, lemon tart and hazelnuts framed with sweet oak notes. 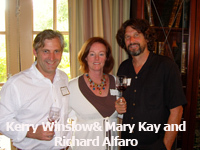 Richard and Mary Kay Alfaro are also making some fine estate Syrah and even a Bordeaux-style estate Merlot that they are releasing soon. I’ve been drafted into service and I am now known as Agent Noir, and my mission will be to do guest reviews for the agency. The Wine Spies are your secret undercover deal makers and they search out some amazing wine finds! 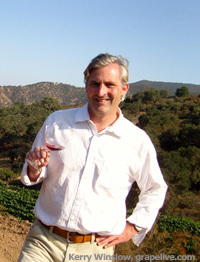 This Saturday they are going to feature one of my big favorites: Parsonage Estate Syrah, from Carmel Valley! Don’t miss out and as a bonus to my readers, The Wine Spies are offering an extra special discount to you. Be sure to use the special Grapelive promo code on the coupon below to get an extra 10% off your orders. This last week has been a blur, a real frenzy of wine and vineyards to taste and try. But, it really is the people that matter most and the friendships that have developed that move me. I have been very lucky in the last week to have seen some of the kindest and talented people based here in the Monterey Bay area, and of course try their wonderful wines and or see their amazing vineyards. My latest trek took me out to the Garys’ , Rosella’s and Pisoni Vineyards, all in the Santa Lucia Highlands, and though I’ve been out to Pisoni before, I had never been to Rosella’s and Garys’ Vineyards, so it was with a lot of excitement I went touring out there with. 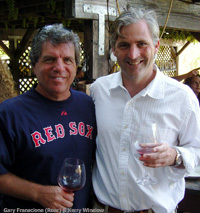 Gary Franscioni and Gary Pisoni, long time friends are partners in the Garys’ Vineyard and it is mostly planted to “Pisoni clone” Pinot Noir, and this is what it is most famous for. That said they have really turned a lot heads with their Syrah from this site and I can tell you it is fantastic, especially the 2006 sample I was lucky enough to get my hands and palate on. Franscioni has his own vineyard too, this the Rosella’s Vineyard named after Gary’s wife Rosella, and this site is planted to Pinot Noir, Syrah & Chardonnay, all of which are top flight grapes and make wine to drool over. 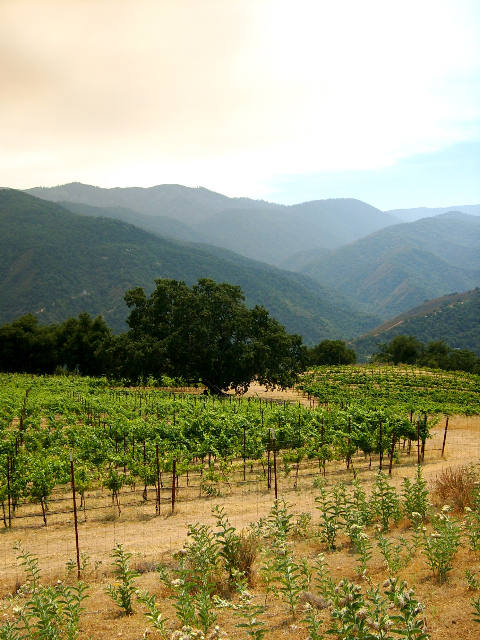 Rosella’s Vineyard is the coolest of the vineyards and usually picked last, and has shown to be a perfect place for well-developed Chardonnay and dark and floral Pinot Noirs. Though in recent years the Pinots have got much richer and the Syrahs are doing extremely well here too. The long hang time and multitude of clones give lots of complexity and depth as the vines age here. The main partnership vineyard, the Garys’ is regarded as Grand Cru class and it is very prized among the select winemakers that can get any fruit here. Franscioni and Pisoni have about 20 or so clients that take grapes, all must be friends, make good (great) wine, and of course pay on time! It is almost a license to print money, as almost every Pinot made from Garys’ fruit is a sell out! Honestly, can you think of a bad Garys’ Pinot Noir? Not easy, and I recently went crazy for the 2006 Martin Alfaro Pinot Noir Garys’ Vineyard and remarked it may be the best yet from them, and I can say that Franscioni’s own label Roar, now made by Ed Kurtzman, is getting even better, especially these 2006 vintages. 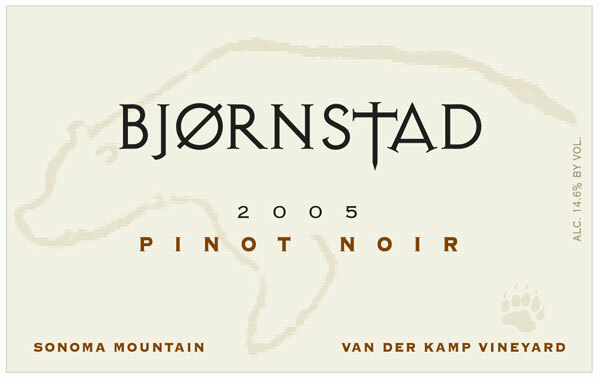 2006 was a tough year and for the most part the Pinot Noirs have been lighter in color and in some cases in flavors, but not from these guys’ vineyards! 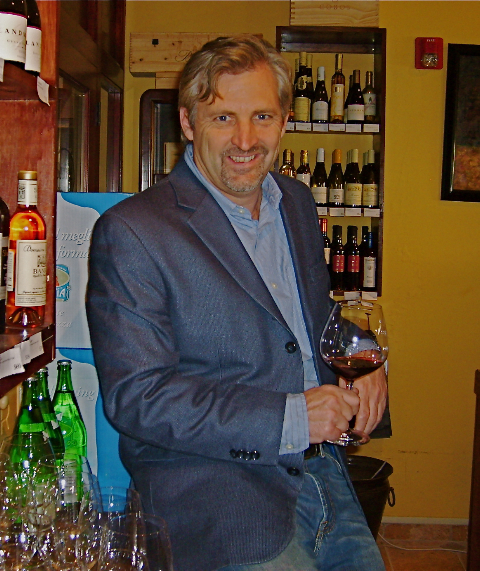 Both the Roar (Gary Franscioni) and the Lucia (Pisoni Family) are intensely rich and darkly colored wines with well developed aromatics and lush textures. Then there is the Syrahs, and they are super impressive with purple/black color and loads of black fruit, violets and white pepper with great length and long finishes. 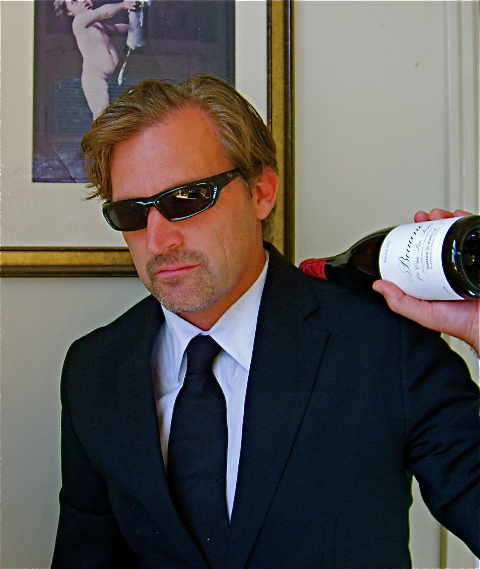 Oh, and I should also mention, just in case you don’t take my word on this, Robert Parker rated the Garys’ and Susan’s Hill (Pisoni Vineyard) Syrah’s between 93 and 95 Points for the new 2006 releases! These are due out in late September or October 2008, so get on both the Lucia and Roar websites and sign up to receive their offers, and get your pre-release order in as soon as possible. Then there is the magic place, the vineyard that made Monterey known for world class Pinot Noir and really put us on the map, I’m talking about the Pisoni Vineyard. We locally cannot argue about that, Gary Pisoni deserves all his success and fame, and I will always tell him so, every time I see him! This place is our Romanee-Conti, a sacred place, and a place where Monterey’s fortunes turned around. Pisoni Vineyard has to be the most famous if not the most sublime site in California for powerful and mind blowing Pinot Noir. It took Gary Pisoni awhile to showcase his vision, and he had many doubters, but he perused his dream and won everyone over in the end with these grapes. 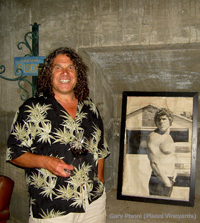 His son Jeff makes their own wines under the Pisoni and Lucia labels, and his talents are now also well known and highly respected. Mark Pisoni the other son, wears many hats, he gets to run all the vineyards and do most of the business and public relations work, including helping Gary Franscioni over at Garys’ and Rosella’s. Now, getting back to my point earlier, it is all about the people, these very hard working and in demand people. They deserve all their successes and many more too, as they are some of the nicest and kindest people you’ll ever meet, and not just in the wine business either, I mean it, these are special souls with huge hearts. It makes drinking their wine all that much more special. Pisoni’s 2006 Estate Pinot is coming out this fall too, and look for it to be one of the best yet, but make sure you get your favorite wine merchant to line some up early or at least get your name on the Pisoni list. I was lucky and got a sneak peak at a few versions and came away very, very impressed. The 2006 Roar Pinot Noir Pisoni Vineyard was awesome with lovely fruit and sweet smoky goodness, and is all ready a star, drinking great now and even though Gary Franscioni likes them really young himself, it should get even better with a year or so in bottle and age well for 5-7 years. These guys are good! To celebrate the Fourth of July and the American Dream I’m going to give a quick nod to some great American Pinots I tried at Pinot Days last weekend in San Francisco. This was my first Pinot Days event at Fort Mason, and it was awesome with lots of fantastic wines and many winemakers and winery owners on hand to tell their stories and share their visions of Pinot Noir and the vineyards where it is grown. For me the event was a success in everyway and I enjoyed meeting so many new people and finding even more exciting wines, plus catching up with old friends which makes it just that much more special. The big surprise was the amazing showing of Oregon Pinots; this fun little rivalry between California and Oregon was the real highlight of the Pinot Days event. I was not just me that noticed these super Oregon Pinots, I was walking the show with a California Pinot Noir winemaker and we both agreed that the Oregon wines came out on top on this day. To be fair most of the Pinots came from the 2006 Vintage, which flatters the big rich, vintage from Oregon, which is not typical and for which California is more known for and that had a slightly lighter vintage in 2006 by comparison. Still even in a tough year like 2005, Oregon still produced some real gems and a few were shown at Pinot Days to good effect. The California stand outs included some sublime wines, here are a few from my mental notes that stuck out from the crowd; the 2006 Bjornstad Pinot Noir Van der Kamp Vineyard, Sonoma Mountain, the 2006 Freeman Pinot Noir, Russian River, the 2006 Martin Alfaro Pinot Noir Deer Park Vineyard, Santa Cruz Mountains, the 2007 Auteur Pinot Noir, Sonoma Stage *Barrel sample, and the 2006 August West Pinot Noir Graham Vineyard, Russian River. All of which are between $35 and $50 each and offer lots of bang for the buck, especially the Martin Alfaro Deer Park. The humble and friendly Joe Martin was pouring the beautiful 2006 Martin Alfaro Deer Park, which was competing nicely against the hundreds of other top Pinots on display and again tells me that there is a spot for the South Santa Cruz Mountains in the list of great Pinot Noir Terroirs! Now for the Oregon Pinots that stole the show, they included; the 2006 Auteur Pinot Noir Shea Vineyard, Willamette Valley, Oregon *Maybe my wine of the day, the 2005 & 2006 Vidon Pinot Noirs, the 2005 & 2006 Stoller Vineyards Pinot Noirs, and the 2006 Lachini Vineyards Pinot Noir, Willamette Valley. Again it was a surprise to find that even the tough vintage 2005 wines showed so well, but there is no doubt the 2006 Oregon vintage is a blockbuster year and I recommend trying and buying them up before they sell out. Beyond the Pinot Days event, I can say find the 2006 Bergstrom Pinot Noirs, the 2006 Beaux Freres Pinot Noirs and any 2006 Shea Vineyard Oregon Pinot, as they are some of the greatest Pinots I’ve tasted this year.